The Musketawa Trail began its existence as the Muskegon, Grand Rapids and Indiana RR (MGR&I) when it was incorporated on January 18, 1886. It was the second rail line built into Muskegon and was intended to be a competitor to the first line which the current CSX RR still operates into Muskegon from Holland. $350,000 was raised for construction. The first train from Grand Rapids arrived in Muskegon on November 4, 1886. On December 1st, 1886 the line was completely finished and within weeks it was being used by 38 freight and passenger trains a day. The line was leased to the Grand Rapids & Indiana RR (GR&I) from its beginning. The MGR&I was a branch line of the GR&I main line which ran from east central Indiana, through Grand Rapids and up to Mackinaw City. Part of this line is now the White Pine Trail. The GR&I purchased the MGR&I outright on June 17, 1917 and back dated the effective date of the sale to May 1st of the same year. 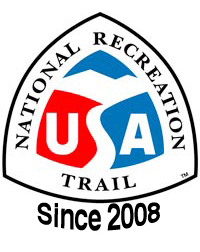 The GR&I itself was controlled by the Pennsylvania RR (PRR) and eventually became part of the PRR on January 1, 1921. The Grand Trunk Western (GTW) began operating jointly with the PRR over this line under trackage rights (basically paid permission) granted by the Pennsylvania RR in 1946. The GTW had abandoned its own line between Greenville and Muskegon but still needed access to Muskegon to service its car ferry operation across Lake Michigan. The Pennsylvania RR merged with the New York Central RR on February 1, 1968 to form the Penn Central. Penn Central was bankrupt by the early 1970’s. Since Penn Central was responsible for maintenance, track conditions on the line became quite poor with train speeds usually limited to less than 10 mph. 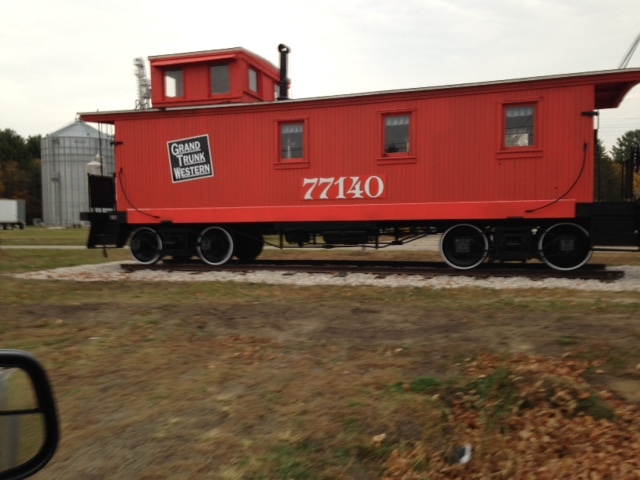 Caboose after cleanup and a fresh paint job by The Ravenna Chamber of Commerce. GTW and Penn Central were still both operating trains over this line until Conrail was created on April 1, 1976 from the remains of Penn Central and several other bankrupt eastern railroads. 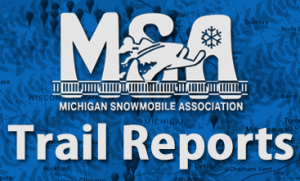 The creators of Conrail did not want the Grand Rapids-Muskegon line as part of their new system. The GTW saw this as an opportunity and purchased the line. It upgraded the track back up to a 49 mph speed limit to serve its car ferry service, sand mines and other businesses on the south side of Muskegon. It also serviced the grain elevators in Conklin and Ravenna. The railroad car ferries quit operating out of Muskegon in 1978 and rail traffic on the line dwindled to a point that was no longer profitable to the GTW. GTW sold its Grand Rapids Subdivision from Muskegon to Durand to the Central Michigan RR on September 4 1987. They could not build business to an sustainable level on the section between Marne and Muskegon and rail service was discontinued in January of 1989. The tracks sat unused until they were removed in the fall of 1990. Please send any additions or corrections via our contact form.